The government disagrees with the peers' suggestions. An influential group of peers has accused the government of putting its "head in the sand" after it rejected their ideas for dealing with e-crime. But the government did not agree with its suggestion that lawlessness "was rife" on the internet. Committee member the Earl of Erroll said the government's response was "a huge disappointment". In its report, the Lords committee criticised the government's "Wild West" approach of leaving internet security to individuals as "inefficient and unrealistic". 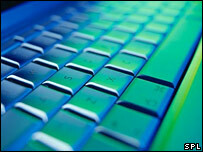 It called for the police and criminal justice system to have more resources to catch and prosecute internet criminals. The peers recommended a central law enforcement agency for reporting e-crime, incentives for banks and other companies trading online to improve data security and the setting up of a "kite-mark" to identify internet service providers that guaranteed a secure service. And they also argued that steps should be taken to establish legal liability for damage resulting from security flaws found in hardware or software. But the government made no commitment to accept any of the recommendations. In a statement, it said: "The government does not agree with the implication that the public has lost confidence in using the internet. "As such, we would refute the suggestion that ... lawlessness is rife." The response went on: "The government does take seriously all crime committed by use of the internet and agrees with the committee that confidence in the internet is vital. "Legislation will be kept under review, but the government does not consider imposing additional burdens on business is the best way forward." The Earl of Erroll said: "Unfortunately, the government dismissed every recommendation out of hand and their approach seems to solely consist of putting their head in the sand." During its inquiry, the committee heard "compelling evidence of substantial amounts of e-crime". "We recommended that the government set up a group to develop a scheme for recording all forms of e-crime," the earl said. "The reply just says that the government 'do not see that there is a need for this'. If you have no idea of the scale of the problem, how can you design solutions?"